Sharif Abdel Kouddous Reports from Cairo on Rising Sectarian Tension in Egypt After Deadly Attack on Coptic Christian Church | Democracy Now! AMY GOODMAN: We turn to Egypt, where 12 people died, more than 180 were wounded, during clashes between Muslims and Christians in Cairo. Egypt’s army has said 190 people were detained after the fatal clashes, will face military trials. The justice minister also issued a warning. MOHAMED EL-GUINDY: [translated] The government warns all those who threaten Egypt’s security: they will be confronted with firmness and power. And the cabinet will continue to convene in meetings to follow up on the situation and take the necessary action. AMY GOODMAN: That was Egypt’s justice minister speaking about the riots over the weekend. Saturday’s violence started after several hundred conservative Salafist Muslims gathered outside the Coptic Saint Mena Church in Cairo’s Imbaba district. They were reportedly protesting over a months-old allegation that a Christian woman was being held there against her will because she had married a Muslim man and wanted to convert to Islam. The woman has dismissed the allegations in an interview on a Christian TV channel. Coptic Christians account for about 10 percent of Egypt’s population. Rival groups threw fire bombs and stones and fired gunshots. The church and some nearby homes were set on fire. One of the wounded insisted the assault was premeditated. ASSAULT VICTIM: [translated] I think it was a planned attack. They set fire to one church after another. For sure, it was planned. AMY GOODMAN: We’re going to go right now to Cairo, joined by Democracy Now!’s Sharif Abdel Kouddous. Welcome to — back to Democracy Now!, Sharif. It’s great to have you on with us. I know, even today, there’s major traffic in Cairo right now because of the protests that are taking place, so you couldn’t make it home. But tell us what is happening and what happened over the weekend. SHARIF ABDEL KOUDDOUS: Well, Amy, you gave a good description. A crowd of a few hundred at least partly Salafi protesters descended on a church in Imbaba. And after a couple of hours, gunshots erupted, clashes erupted, Molotov cocktails were fired. By some counts, the death toll has reached 12, the wounded at 220. A least 65 people were shot. This was a major attack. And what many people, and many Coptic people in particular, do not understand is why the military, who was present at the scene while the violence was happening, stood by while the worst of it took place and did not intervene. The Prime Minister, the interim Prime Minister, Essam Sharaf, cancelled a tour of the Gulf Arab states to chair a cabinet meeting on the violence. And the Supreme Council of the Armed Forces, which is running the country, announced it will use, quote, “an iron hand” to protect national security. And like you said, they have rounded up 190 people. It’s unclear exactly who these people are, whether they were just rounded up on the streets. But they will now be tried in military courts, which many human rights groups have criticized because they constitute wholesale violations of basic fair trial rights. I’m actually speaking to you from the building of a press conference against military tribunals. But I think what the response to the attack that we saw yesterday and that I witnessed was a group of Coptic protesters went to the public prosecutor’s office in downtown Cairo and stood and asked for a fair prosecution, asked for the attackers to be tried, and then they marched across downtown Cairo to the state TV building, where Coptic protests have been held before. At some point, they were met by a group of what looked like just young men from the area. Clashes ensued. I witnessed a lot of rock throwing and bottle throwing, with some minor injuries, before military police finally intervened. But then hundreds, thousands of Copts descended on the state TV building and held quite a big rally there, calling for the protection of churches, calling for the attackers to be prosecuted, and calling for equal protection under the law. And they — many of them spent — many hundreds of them spent the night there. They’re still camped out in front of the TV building. It’s unclear what’s going to happen. I think what needs to be said is, though, the response by the government in this case is troubling. It has said it will step up security at religious sites, which is fine, but it also said it will activate laws dealing with terrorism to give the police more power to prevent sectarian violence. The rules would enable a stricter punishment for sectarian incitement, which includes the death penalty. But what many tell me — and this worries many human rights campaigners — is that this will only strengthen the hand of the security state that was so prevalent under Mubarak and will ultimately lead to the suppression of dissent. They did not need to enact new terrorism laws to deal with this problem. They simply need to enforce the law, because what’s happening with the sectarian violence that’s happening right now, I think, is systematic of a bigger problem of increasing lawlessness in the country since the revolution. The army has not enforced the law. The police are not — are being too lax in dealing with crime here, from sectarian violence down to petty crime. And so, it will be the military — eyewitnesses have described the military standing by on Saturday night as the church in Imbaba was attacked with Molotov cocktails, and a gun battle, in which 12 people were shot, 220 were wounded, 60 — sorry, 12 people were killed, 65 were shot, and 220 were wounded — a very violent attack. And so, both the rise in the sectarian violence is very troubling, but so is the government’s dealing with it, as well. AMY GOODMAN: I wanted to turn Michael Meunier, a Coptic politician and activist, speaking this weekend. MICHAEL MEUNIER: We are staying here as long as it takes — a day or two, a week or two. We need a stronger message. We are actually joined by tons of Muslims. We’re organizing for a Friday possible march to the military council headquarter. This is not about Christians or Muslims. This is about Egypt. This is about the majority of Egyptians versus the fanatic elements of Egyptians. If Muslims start killing Christians, and Christians start killing Muslims, we’re going to have a Lebanon. We’re going to have a country that’s disfigured. And unfortunately, the revolution would be stolen, as it is being stolen right now in front of everybody that participated in it. AMY GOODMAN: That was Michael Meunier, a Coptic politician and activist. Sharif, you said you just came from a news conference. What was the — who was speaking, and what were your questions? SHARIF ABDEL KOUDDOUS: Well, Amy, at this conference, they are talking about this rise in the number of military tribunals that have taken place since the revolution. One journalist here said that 10,000 civilians have been tried by military courts in the past three months — a shocking number. Military trials are supposed to be reserved for soldiers and cases of terrorism. But what has been happening and what has been very troubling is that a lot of protesters who have taken to the streets over the past three months since Mubarak stepped down, calling for further demands from the Supreme Council, have been rounded up, have been arrested, and have been tried in military tribunals. They did not get to choose their lawyer. They’re sentenced to between three and seven years. And so, this is a very worrying case. And many point out that Mubarak, his sons, the corrupt politicians, senior members of the National Democratic Party, who are under arrest and are under indictment, are receiving a regular trial with their lawyers. And they ask, how can the revolutionaries, the young revolutionaries, who took to the streets to topple this regime, be treated to these military tribunals while the regime, the dictator himself, is receiving a regular trial? So, there’s families of those detained here who are speaking out, who are telling their stories. There’s journalists, as well. And they’re trying to call on the Supreme Council to stop this very troubling rise in the prosecution of people under this military tribunal system. AMY GOODMAN: I wanted to turn to Mohamed Abdel Dayem, joining it, with Sharif Abdel Kouddous, in talking about what’s happening to journalists in Egypt, also in Tunisia. MOHAMED ABDEL DAYEM: Well, among the many thousands that have been tried in military tribunals since the end of the revolution, is actually one journalist: a blogger by the name of Michael Nabil Sanad, who was sentenced to a multi-year prison term in a military tribunal, in a procedure that was deeply flawed and arguably unconstitutional, simply for writing an opinion piece on his blog about the performance of the Supreme Military Council. So, the military trials for civilians are deeply troubling for a number of reasons, many of which Sharif has already talked about. But I wanted to focus specifically on how it relates to journalists. We’ve also witnessed a number of attacks on journalists who were trying to report on the events that — and unfortunate events — that took place in Imbaba this last weekend. Up to a handful of journalists, both local and international, were physically assaulted, had their cameras taken away from them and smashed, frequently by plainclothes thugs. So, it’s not really even clear who these people were or why they were trying to destroy equipment and footage. AMY GOODMAN: Sharif, can you tell us what happened on the ground this weekend? SHARIF ABDEL KOUDDOUS: Well, Amy, I was not — I did not go to Imbaba on Saturday night, in part because of that reason. I heard that some journalists had been attacked and had been chased out, and one had lost their camera. So, and as Mohamed said, it’s unclear exactly who’s doing it, whether it’s residents. I mean, there is some antagonism against foreigners sometimes. Or it could be these plainclothes thugs, which have done this in the past in Egypt for many years. So, on the streets yesterday in downtown, during this mass Coptic protest, there was no violence against journalists. We were filming openly. And everything seemed to go fine. So I think it really depends on where you are, but it is a troubling rise in the attacks on reporters here in Cairo. AMY GOODMAN: And how was it to return, Sharif, to return to Egypt after you’ve been away for about a month, having reported from Tahrir for the uprising? SHARIF ABDEL KOUDDOUS: Well, I’m very happy to be back here. There’s a lot of issues that need to be worked on. There’s a vibrant debate, talking about political discourse, about what needs to happen. There’s a lot of problems, frankly, that need to be resolved before these elections come in September and November. And there’s a lot of healthy debate that’s happening. So it’s very interesting to be back, and it’s hard to keep up with all the stories that are happening all around every day. AMY GOODMAN: And Mohamed Dayem, very quickly, Tunisia, what is happening there? 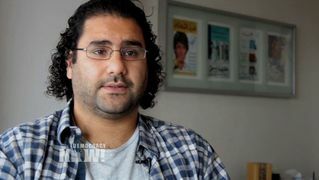 MOHAMED ABDEL DAYEM: Well, last weekend, as well, I think up to 15 journalists were attacked, this time by riot police and regular police in uniform, as they were trying to report on the unrest that’s unfolding in Tunisia once again. So, it’s something to keep in mind, that just because these revolutions have been successful and the autocrats have been removed, that doesn’t necessarily mean that we have a free press in any of these countries. AMY GOODMAN: Well, I want to thank you both very much for being with us, Mohamed Abdel Dayem, coordinator of the Middle East and North Africa Program at Committee to Protect Journalists, and Sharif Abdel Kouddous, Democracy Now! correspondent in Cairo.